It has been hardly a month since Disney's "merger" with Fox, and the timing of Dumbo's release must have surely had some planning on Tim Burton's part, given the movie has been in the works for almost five years now. You can't help but notice the symbolism in the film, as Burton appears to draw parallels from the real-life layoff of thousands of employees by Disney through making one of the characters greedily fire an entire troupe of showmen after getting his hands on their showcase act. Very interesting, indeed. As for the movie itself, it is pretty unremarkable by Burton's standards. Hear us out - "by Burton's standards" is what needs to be stressed here, as Dumbo isn't a bad movie by any standards. Burton's signature is to have us feel for outlandish characters - we have rooted for Edward Scissorhands and the Corpse Bride before - and this is where the live action reboot of Dumbo fails to shine. The new Dumbo deviates from the original quite a bit, with the main change being that the side characters are all human. Gone is Timothy Q Mouse (well, not entirely - there is a mouse in circus garb that pays homage to Timothy but with no other impact in the story) - instead it is the Farrier family that teaches Dumbo how to fly. 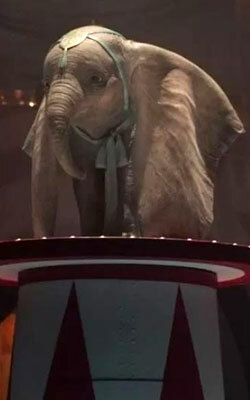 Science-loving Milly Farrier (Nico Parker) and her little brother Joe (Finley Hobbins) incentivize Dumbo to make use of his flying skills for rescuing his mother after their father Holt (Colin Farrell), a one-armed war veteran, loses his act with horses and is relegated to caring for the circus elephants. Dumbo becomes a sensation and attracts attention from the devious V A Vandevere, owner of the Dreamland amusement park, who enters a deal with Max Medici (Danny DeVito), the eccentric owner of Medici Brothers' Circus. In a sudden change of location, the troupe arrive at Dreamland (which is suspiciously similar to Disneyland) where Medici is made partner, and Dumbo the star attraction. Vandevere's paramour Colette Marchant (Eva Green), a French trapeze artist and the "Queen Of The Heavens", rides with Dumbo as they mesmerize the audience together, only in ways that are not part of the greedy entertainment mogul's plan. Tim Burton has taken on another children's tale after Alice in Wonderland and tried to put his own spin on it, with the same, uninspiring outcome. Apart from what one can suspect is a dig taken at Disney itself, there doesn't seem to be much unique about Dumbo. And it is hard to take even that criticism seriously when Disney itself is going to profit off Burton's movie. That is not to say that there aren't moments which bring genuine wonder into the viewer's eyes. Dumbo's clumsy journey from an hapless baby flapping his ears to an elephant who soars majestically over the crumbling Dreamland is extremely enjoyable. The amount of emotion that the technical team has managed to convey through the baby elephant is nothing short of miraculous. Dreamland itself has a lot of potential, with the slightly darker setting that Burton has so masterfully handled before, but like everything else, falls short. Colin Farrell, who plays the wannabe-cowboy hero, and Eva Green, the graceful trapeze artist, do what the script demands of them (which is not much) while looking good. Danny DeVito is perhaps the most memorable of the cast, with his portrayal of an eccentric carnival boss-man. Michael Keaton ends up looking like a pantomime villain, especially at the end where he is crazily pulling on levers. We're not sure why Nico Parker looks and sounds so mechanical, and Finley Hobbins so unremarkable; but it is perhaps the script at fault again. The music was a major reason for the success of the original, even winning an Oscar for the Best Original Music Score, but the reboot falls short in this department. For instance, the iconic song "Baby Mine" where a heartbroken Dumbo is comforted by his bound mother is recreated, but for such a short while that you almost miss it. Cinematographer Ben Davis manages to capture both the light-hearted, sweet setting of the original animated film and the less frequent but dark "Burtonesque" scenes equally well. 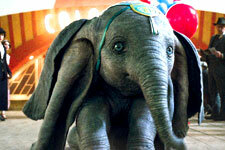 Dumbo himself is incredibly cute, and steals the show every time he comes on. If it were not for those oversized ears, you could be forgiven for considering Dumbo to be the real deal. If you're a fan of the original animated movie, the new one is going to rub you the wrong way. It is decidedly more complicated but less enjoyable than the original, and comes across as a valid reason for doubters to call Disney's decision of making live action reboots a blatant cash grab. On the other hand, it is an decent family entertainer, and if you really like adorable elephants, Dumbo would be a decidedly better watch than the other release of the week that also features tuskers. fullhyd.com has 700,000+ monthly visits. Tell Hyderabad what you feel about Dumbo!